Business confidence takes a turn for good with business leaders pinning hope on the annual Budget, finds the latest Business Today-C fore Business Confidence Survey. The business sentiment has shown some semblance of revival in the third quarter of the financial year, after taking a beating for two consecutive quarters. 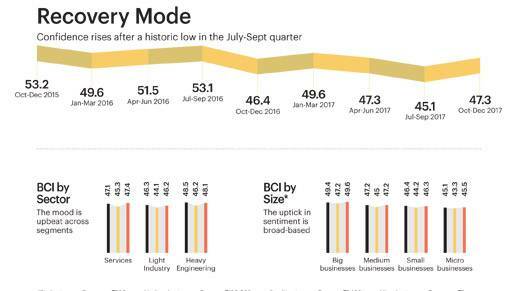 The business confidence index in the October-December quarter, on a scale of 100, jumped marginally to 47.3, from 45.1 in the quarter ended September 2017. The annual Budget, slated for February 1, offers fresh hope to business leaders in a tough economic environment. However, since the macro picture hasn't improved much, it's unlikely that the Budget will continue to keep up the sentiment for a long time. Market research agency C fore quizzed 500 CEOs and chief financial officers across 12 cities for the survey for the October-December period. The confidence in the July-September 2017 quarter was the lowest ever since the survey began in the January-March 2011 quarter. 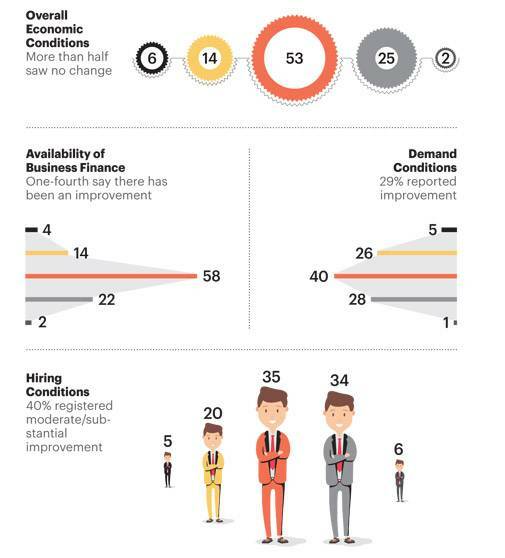 This round of the survey shows that business leaders are expecting status quo in the January-March quarter. 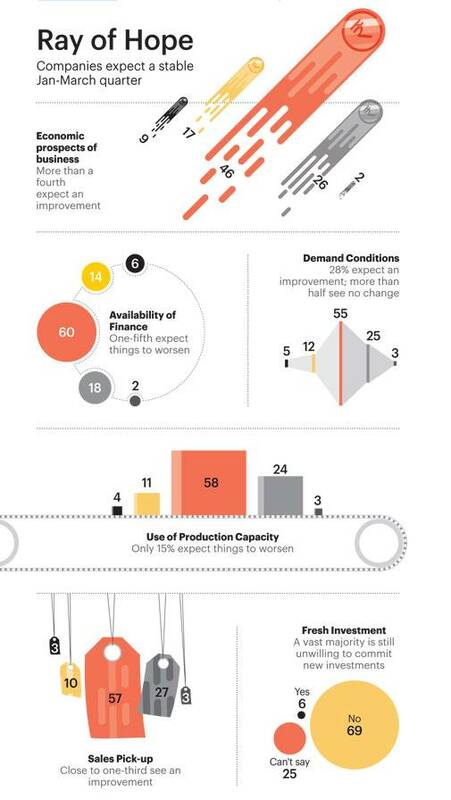 On parameters such as overall economic situation, financial situation, availability of finance, cost of external finance, production level, order book, cost of raw material, utilisation of production capacity, sales, hiring and profits, respondents are more optimistic in the latest survey in comparison to the previous one. In the latest survey, for instance, just 24 per cent respondents are expecting the overall economic situation to worsen in the January-March period. In the last survey, the corresponding figure was 35 per cent. 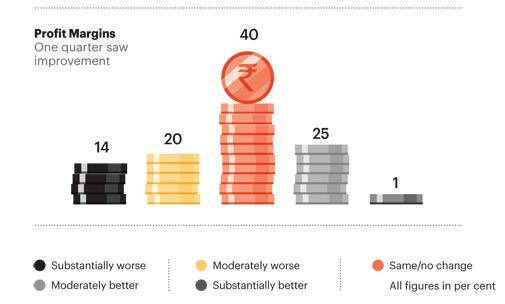 Similarly, 44 per cent of the respondents were expecting their financial situation to deteriorate in the previous survey, whereas in the current survey, that number stands at only 20 per cent. Upasna Bharadwaj, Senior Economist at Kotak Mahindra Bank, says that some kind of stability has been achieved after the implementation of GST (goods and services tax) last year. "People are realigning, and several adjustments are taking place. Yet, there's a long way to go before we start to reap the benefits of GST," she says, adding that "lot of things are getting sorted out, including the twin balance sheet problem, which means corporates are deleveraging gradually and bank recapitalisation has already started." The GDP estimates of 2017/18 show that the Indian economys growth is at a four-year low. According to the Central Statistics Office (CSO) forecast, economic growth is expected to be 6.5 per cent for the current financial year, lower than the 7.1 per cent registered in the previous fiscal year. The survey highlights that a majority of the respondents - 52 per cent - have their hopes pinned on the Budget to boost the economy over the next year. Siddhartha Roy, Founder, SR Associates, an economic think tank, says that with the GST coming in, the Budget is expected to focus on expenditure and direct taxes. "The uncertainty around the Budget will be far less this time around. On the direct tax side, some expectations are building up that corporate tax rates might go down," he adds. A majority of survey respondents - 59 per cent - says that the government should prefer maintaining fiscal discipline over meeting populist demands in the upcoming Budget. The sure-shot breach of the fiscal deficit target, rising inflation, the need to improve the rural economy and create jobs have put the government in a precarious situation. The impending general elections next year are only adding to its troubles. Experts say that the quality of expenditure is something to watch out for in the upcoming Budget. "If it's about creating assets, I don't have a problem. There's a huge potential to create rural assets," says Bharadwaj. The survey highlights that 69 per cent respondents do not plan to make fresh investments in 2018. Without fresh investments, it's difficult to keep the wheels of the economy turning. The slowdown in investments over the past several quarters can be directly attributed to lower capacity utilisation and weak demand. Just 27 per cent respondents expect capacity utilisation to pick up in the next three months; in the previous survey, 22 per cent expected the same. As per the Reserve Bank of India data, capacity utilisation stood at 71.2 per cent in the first quarter of 2017/18. For new capacity to be added, this number has to climb up to 80-85 per cent. "There's not enough demand right now. It will take three-four quarters before fresh capacity is added," says Bharadwaj. The survey shows that 27 per cent expect hiring to pick up over the next three months, which is substantially higher than 7 per cent in the previous survey. The jobs are likely to be a focus area in the Budget. The government may introduce the first National Employment Policy to create jobs in every industry. As a supplement to the BCI survey, we carry out an assessment of other indicators of economic growth. These include macro-economic conditions such as export-import data, IIP (index of industrial production) and consumer price inflation (CPI). While IIP growth reached a 17-month high in November 2017 to 8.4 per cent, CPI rose to an uncomfortable level of 5.2 per cent last December, a 17-month high. The rising industrial output shows signs of recovery, but high inflation can hamper further upside, as RBI will most likely pause on interest rate cuts for a while. Both exports and imports grew marginally in December. Imports grew slightly higher - at 4.7 per cent - on the back of rise in international crude oil prices and higher non-ferrous metal imports. "Exports are growing far slower than they should. Readymade garments, and gems and jewellery, exports remain areas of concern," says Roy. In his fifth Budget, and technically the last one, Finance Minister Arun Jaitley may not be able to prescribe the perfect antidote for the limping economy, but the sentiment is buoyant nevertheless.